Dine Michelin Star for a night with Michelin Star Chef and Owner of L’Ecrivain in Dublin, Derry Clarke, at the marvellous Muckross Park Hotel & Spa on Friday 19th October 2018! This package includes a drinks reception and an Autumn themed tasting menu created from some of Derry Clarke’s favourite recipes. Enjoy overnight stay in a deluxe bedroom with breakfast the following morning for 2 guests. Complimentary use of The Spa at Muckross is included during your stay. The overnight package is €150 per person sharing while you can also avail of a package without accommodation for €65 per person. 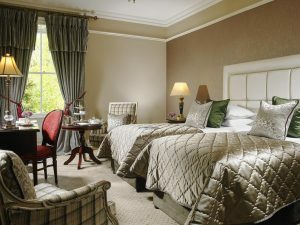 The Muckross Park Hotel & Spa is ideally located in the heart of the stunning Killarney National Park and offers a tradition of Irish hospitality & history with modern, luxurious facilities. Killarney National Park surrounds the hotel and offers guests spectacular walking trails, cycle routes, historic tours, horse riding and lake activities.